Diogenis Studios is a beautiful complex, located at a perfect setting at Saint George Beach, just 10 metres from the beach and offers spectacular view to the Aegean Sea. Accommodation in Naxos Studios Diogenis Finikas beach cafe It consists from the accommodation building and a beach cafe that is the place you can spend hours relaxing, having a drink or a snack on the sandy beach and enjoy the magnificent beach. You will feel the joy of watching the magic blue of the sea or having romance and relax in the evening in the unique environment. Studios Diogenis offers studios and apartments that can accommodate from a single up to 4 persons family. Its position, on the beach, makes Diogenis the ideal place for beach lovers, careless and memorable holidays. All rooms are air-conditioned and equipped with kitchenette and refrigerator. Maid is offered on daily basis. OASIS studios is a group of studios (could also be considered as: hotel, rooms, apartments) on the unspoilt beach of Mikri Vigla, Naxos and successfully combine modern facilities with the traditional Cycladic architecture. It is a 20min drive away from Naxos harbour and 120m. from the beach of Parthenos. During the day you can enjoy swimming in the pool or in the crystal waters of the beach nearby or even try some sea sports like windsurfing and kitesurfing. Also you can enjoy snacks, refreshing shots and exotic cocktails at the cafe pool bar Oasis. At night you can chill out enjoying your drink next to the pool or even on the beach. Services and Facilities at Oasis Studios! OASIS studios is a group of studios (could also be considered as: hotel, rooms, apartments) on the unspoilt beach of Mikri Vigla, Naxos and successfully combine modern facilities with the traditional Cycladic architecture. It is 20 km. away from Naxos harbour and 120 m. from the beach of Parthenos. Saint George Hotel in Naxos Island, is perfectly situated on the golden sandy beach of Saint George Bay in Naxos Town (Hora) of Naxos, just 10 meters from the sea and offers marvellous sea views over the magnificent bay. The atmosphere is very friendly and the family and tranquil environment will make you feel you are in your own place or like being living here for years. It is a family run hotel and the hospitality is one of the main reasons for the returning guests every year. Being on the beach and very close to Naxos Town main square, Saint George Hotel is the ideal place for beach lovers. via Naxos zas-travel | Naxos Accomodation Car rentals Excursion in Naxos. All travel and tourim arrangements – Tour Operators, specialized in incoming tourism in Naxos & Cycladic islands. Naxos Greece – Alkyoni Beach Hotel on Naxos Island – Chora – The Rooms and apartments. All our rooms of the hotel are equipped with air condition, refrigerator, satellite TV, verandah and direct dial telephone. They are traditionaly built, most of them having an excellent sea view and the rest with an equally beautiful view of our gardens and swimming pool. We created an earthly paradise 4000m2 of own gardens only a few paces away from the Chora of Naxos, set on the beach of Ai Giorgis and we named it Alkyoni. Naxos Hotels Agia Anna Hotels Naxos Iria Beach Art Hotel in Naxos Rooms Honeymoon Suites Accommodation Naxos Greece. 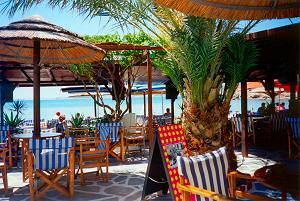 The Iria Beach Naxos Hotel: situated right on the spectacular Agia Anna Beach! The Iria Beach Art Hotel is located in the well-known seaside resort of Agia Anna, on the western coast of Naxos, at close proximity to Naxos Town (Chora), the capital of the island. The hotel is built according to the traditional Cycladic architectural style and is situated next to Agia Anna Beach, one of the most beautiful and popular beaches in Naxos. Guests of the Iria Beach Hotel consider it one of the most charming Naxos Hotels in Agia Anna.